When the weather outside may be frightful, you can always find fanciful fellows to ease winter's harsh grip. 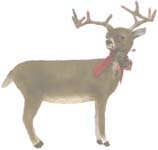 Whether it's angels, skiers, snow people, or winter critters, you will find the perfect thing for your gift giving or collecting needs. Babette Schweizer pewter winter scene. 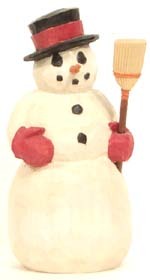 Greg Guedel's hand carved snowmen. Hand-crafted paper mache from "Imagine That". Craig Yenke's animal sculptures, formed, flocked and painted by hand, in the old German tradition. 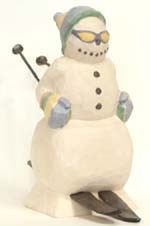 Carved snowman by Vermont artist Karl Neubauer. No winter section can be complete without some winter bears. Click on one here to better see their whimsey!